Orange, CA November 04, 2011 - Tailored Living reports that as home sizes decrease the popularity of Murphy wall beds is on the rise. “Homeowners are realizing they can do the same things in a smaller home that they did in a larger one with smart space design and home organization,” said Dave Angers, director of product development for Tailored Living. The applications for Murphy beds in the home does not stop transforming a home office into an occasional overnight guest room. In fact, Murphy wall beds, which were introduced in 1900, are experiencing a bit of a renaissance that they haven’t seen since the Great Depression. 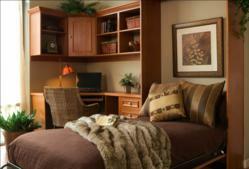 Tailored Living franchisees have incorporated Murphy wall beds into children’s room designs. By day, the beds are tucked away to maximize floor space and allow the room to be used as a playroom or study hall. In the evening, the beds can be lowered for sleeping. In a teenager’s room or dorm setting, a Murphy bed can be incorporated into a study nook or storage space, so there is plenty of room to hang out with friends by day and a restful place to sleep at night. Even hotels are incorporating Murphy wall beds into their rooms. Rather than rolling in an extra bed, hotels will simply lower the Murphy wall bed to accommodate additional guests or children. When it comes time to update your 21st century home, consider adding some 20th century form and function to it with a Murphy wall bed.